When it was first announced that men would be getting their very own New York Fashion Week, style nerds didn't know what to expect. And now that it's finally here, it's safe to say that sneakers were a dominant force from both designers and attendees alike. Designer John Elliott outfitted his entire army of models with Nike footwear and he took the stage himself rocking fragment Air Jordan 1s. The style elite have been jumping from show to show wearing dope sneakers too, proving that hard bottoms aren't the only acceptable footwear choice when it comes to fashion week. 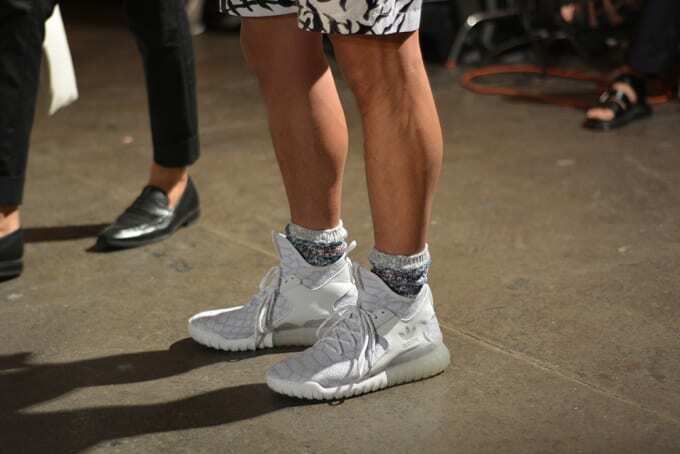 We got an exclusive on-the-ground look at the kicks they were rocking, here are The Best Sneakers Spotted at New York Fashion Week Men's. All photos by Alexis Barnett.